Omega 3 Fish Oil delivers some specialised activated omega 3 fatty acids, called eicosapentaenoic acid (EPA) and docosahexaenoic acid (DHA). These are actually synthesized inside of our bodys—albeit at low concentrations—from an essential fatty acid called linolenic acid. As EPA and DHA are not termed "essential fatty acids", we do not need to consume them in order to survive. However, it seems most likely, as all of the scientific evidence is pointing in this direction, that we do need dietary or supplemental EPA and DHA in order to achieve "optimal health" and prevent chronic diseases, such as cardiovascular disease and osteoarthritis. Interestingly, the diets of people living in developed nations tend to be low in this important pre-cursor fatty acid, called linolenic acid. 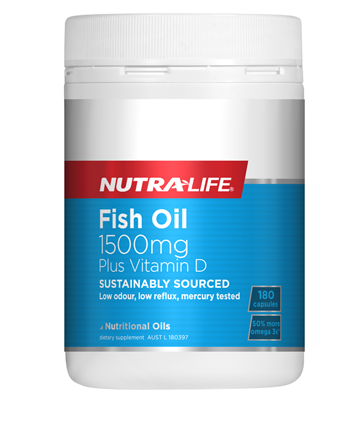 Omega 3 Fish Oil is a convenient way to ensure you achieve an optimal EPA and DHA intake, without having to worry about consuming fatty fish every day through your diet.